Team Love RavenHouse Gallery in New Paltz, NY will present an exhibition of paintings by artist Will Johnson, entitled Every Player is a Star. The exhibition opens June 23rd and continues through September 7th. A reception will be held at the gallery on June 23rd from 4-6 pm. Team Love RavenHouse Gallery eagerly anticipates a special show of paintings by Texas-based artist and musician Will Johnson. Johnson combines text and imagery in his work, gracing his compositionally bold portraits with hand-lettered stories of astonishing, often under-the-radar players and well-loved but now defunct places (his Dead Stadiums series). Subjects featured in this show include Willie Wells, Salty Parker, Debs Garms, Dizzy Trout, Ruth “Tex” Lessing, Marie “Red” Mahoney, Alva Jo Fischer, Bill Buckner, Babe Ruth, Honus Wagner, Burnett Field, Old Arlington Stadium, and Kokernot Field, among others. The works are acrylic on medium density fiberboard, averaging 10”x24”. Signed limited edition prints (with a run of 100) of a selection of his works will also be available for sale. 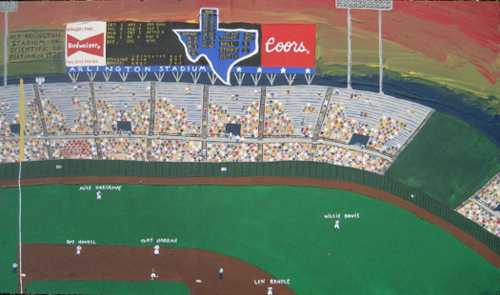 Johnson is a multifaceted artistic talent, who found his way to visual art through his love of baseball and his reverence for the game’s unsung hero. As a self-taught painter and musician, he is a wise and subtle storyteller, spotlighting details and turning the seemingly banal into the most powerful hook. He has participated in multiple group art exhibitions, with this being his third solo show. He has worked on a farm, in maintenance, in comic book distribution, in a record store, in restaurants, as a teacher, delivering cars, transporting equipment, renting out tuxedos, making sandwiches, and cleaning up radioactive and mercury-contaminated waste. He played pony league from the ages of six to twelve, and his earliest baseball memories center around the 1976 World Series. Johnson’s career as a musician includes founding the bands Centro-matic and South San Gabriel. He has recorded and/or performed with Monsters of Folk, Son Volt, Jay Bennett, The New Year, The Drive-By Truckers and Jandek. His most recent project is “New Multitudes,” a Woody Guthrie archival project that include Jim James, Jay Farrar and Anders Parker. Subjects ranging from the well-known …to the virtually unknown… help Johnson curate the ultimate card collection in a larger, singular scale, while he shares a unique insight on the game that is often verbalized among fans, but rarely intimated in such fashion. Team Love RavenHouse Gallery, located in the Village of New Paltz, opened in April 2011. It is the joint effort of Team Love Records and RavenHouse management company, and was founded to provide a physical space for art and music, in an increasingly cyber world.